One might expect evolution to favor one “best” way to mate and reproduce in a given environment. Instead, what we actually find is that many populations exhibit both continuous and discrete variation in reproductive behaviors and mating patterns. 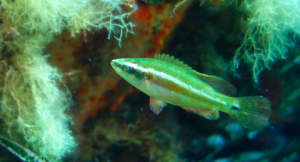 These alternative reproductive tactics can arise from a genetic polymorphism or because individuals respond plastically to an aspect of their environment or individual state. Alternative reproductive tactics are found across taxa and in both sexes. 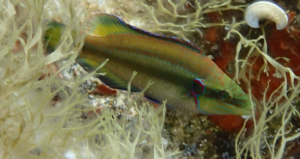 In our main study organism, the ocellated wrasse, three distinct alternative male types (ARTs) exist: 1) Large colorful ‘nesting’ males build nests of algae, court females, care for eggs, and attempt to prevent mating by other males. 2) Smaller ‘sneaker’ males attempt to join a nesting male and female during mating, but do not court females or provide care. 3) ‘Satellite’ males court females, chase sneakers and are tolerated by the nesting male, but sneak spawns at the nest and do not provide care. Males change types between but not within reproductive seasons; these ARTs are not determined by a simple genetic polymorphism, but fall along two pre-reproductive growth dependent life-history pathways (“sneaker then satellite” or “satellite then nesting male”). Early work focused on understanding the evolution of these alternate male tactics and describing how they differ. More recently, we have been studying the hormonal, genetic, and neural mechanisms underlying social interactions among alternative male types in this species. This research focused first on identifying the mechanisms associated with variation in social and reproductive behavior. We are now using this knowledge to measure how variation in these mechanisms contributes to the evolution and expression of reproductive traits and social interactions in this species and in comparison to other species.